The NewerTech USB 3.0 Universal Drive Adapter is the best accessory you can get. 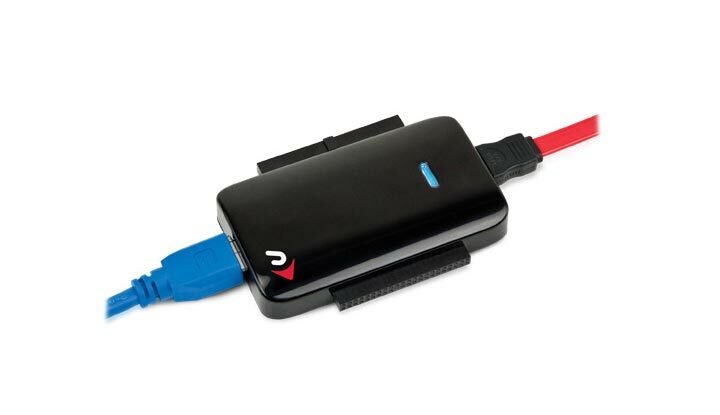 This product makes it so easy to connect a 2.5″, 3.5″ or 5.25″ IDE/SATA drive (hard drive, SSD, or CD/DVD/Blu-ray drive) to any PC or Mac with a USB 2.0/USB 3.0 port. For years I’ve been repairing and upgrading both PCs and Macs, and this product is a must. Moving from the PC to the Mac? Well just remove the drive from your old computer and connect it to your new Mac with the NewerTech adapter, simple. Any drive that is connected with this adapter appears as an ordinary external drive on your Mac, and you can access all the files and copy them wherever you like. You get the adapter, a SATA 2.5″ power adapter cable, a USB 3.0 to USB 3.0 A/USB 2.0 A connector cable, SATA-SATA connecting cable, and a PATA extension cable, a heavy duty auto-switching power adapter and a power cable for drive power. This comes as a complete kit in a box, and you’re ready to go. It comes with a 1 year manufacturer warranty from NewerTech. Amazon usually has the best deals, where you can buy your Newertech UBS 3.0 Universal Drive Adapter.